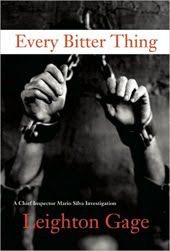 Every Bitter Thing, Leighton Gage’s 4th “Chief Inspector Mario Silva Investigation” is his best book yet. The language is lucid, it’s informative about Brazilian life and culture (the reader even finds out how Rio de Janeiro got its name), the characters are well-defined (and their interaction is natural and often comic), and the plot moves along inexorably and rapidly. It is a story that is closer to the kind of crime novel I’m most interested in as well: the first three Silva stories dealt with big issues (organ theft, human trafficking, disparities of social class and property ownership) and often with torture, organized crime, and extreme violence. Every Bitter Thing, on the other hand, deals with murder and revenge at a personal level, committed not by professional criminals but by more-or-less ordinary people under extreme pressure (which could also be said of the victims of the crimes). There are, I should say, some vividly mutilated corpses, though. It’s also a police procedural in the best sense of the term: each member of Silva’s team is a three-dimensional character, and each has his or her separate role in the investigation. The investigation ranges across Brazil, but is focused more on Brasilia (where Silva’s federal police team is based) than the previous books as well. The nose-to-the-ground view of the investigators at work gives a quite different focus, in comparison with the first three Silva books, which showed a lot more about the crime and the criminals: Every Bitter Thing, as a result, is far more of a mystery or procedural. Though a reader may figure out what’s going on before the end, the investigators are figuring it out at about the same time (and both readers and investigators will be by a final twist or two). The plot begins with the mutilated body of a Venezuelan politician’s son, discovered in his Brasilia apartment. The detectives, joined by the local police, first focus on the son’s private life, but when similar crimes are discovered, in other cities and towns, the race is on to find what these victims shared in common. Just after reading Every Bitter Thing, I heard a recorded-books version of the classic Sjöwall/Wahlöö “story of a crime,” The Locked Room, and Gage’s book bears up well to comparison with that book, as a procedural, a mystery, and a portrait of a society (in fact, The Locked Room contains a lot of editorializing on the authors’ part, and Gage includes his social criticism more integrally, in the dialogue among the characters and the facts of the crime). Though there are some threads running through the plots of all four Silva novels, there’s not so much that a reader will have difficulty picking up the series with Every Bitter Thing. I highly recommend it—my only quibble is with the cover image, which I found a bit puzzling (though it’s an effective graphic). It is unfair to tease Leighton's fans with a book that is under wraps until December. Each book in the Silva series examines, in such great detail, the particular nuances of that books crime. I would find it difficult to choose a favorite book but I think BURIED STRANGERS has a theme that reflects a 21st century nightmare.